Questions? Call 856-368-9085 Balmoor in a Bordeaux Cherry Finish captures the elegance of European design and old world styling. Exquisite detail in acanthus leaf accents and edge gadrooning on worksurfaces give unmatched precedence. Felt-lined center and tray drawers and optional marble top on lateral file reminisce an era of grandness. Computer Credenza has a One Touch Power Manager and accommodates CPU and disk storage. Construction Matched mahogany veneer top surface. Top comes with shaped or straight edges. Finished in Bordeaux Cherry Finish on selected veneers, wood and wood products. Fluted pilasters feature acanthus leaf accents. 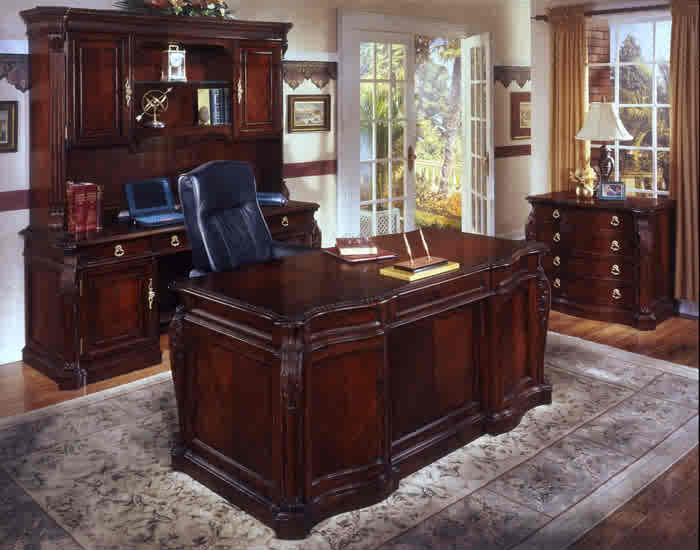 Drawer fronts and desk panels are curved to add old world elegance. Adjustable Levelers All dsks, credenzas and file cabinets have adjustable levelers. Felt-lined center drawer with pencil tray; felt-lined box drawer / box drawer with wood dividers / file drawer per pedestal. 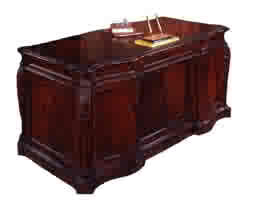 Center keyboard drawer with a drop-front permits use as a traditional center drawer or a keyboard drawer; center drawer is cable accessible; right pedestal features a fully extending file drawer; left pedestal has two box drawers with top box having felt lining and finished pencil tray. Center keyboard drawer with drop-front; box/box/file drawer per pedestal; power strip with 10 cord mounted to inside top of the modesty panel. Drop-front, pull-out keyboard drawer equipped with a power manager; storage shelf in back of kneehole; cable accessible. Left pedestal features a felt-lined drawer with wood pencil tray; a cabinet with a pull-out tray and a pull-out printer shelf. right pedestal features a felt-lined drawer with pencil tray and a 10x21x19.5 computer compartment. Left and right cabinet each one has an adjustable shelf; center cabinet has one, glass, adjustable shelf, canister light; task light; cable accessable. Two cabinets each with an adjustable shelf; task lighting; adjustable wood framed glass shelf; canister light.